The Land Trust’s Green Angels scheme run environmental training courses and volunteering sessions across the town which have made a difference to the lives of many participants. Many of the people involved have benefited significantly from both the courses and volunteering, with some starting up their own landscape maintenance businesses and some finding employment as a result of Green Angels. 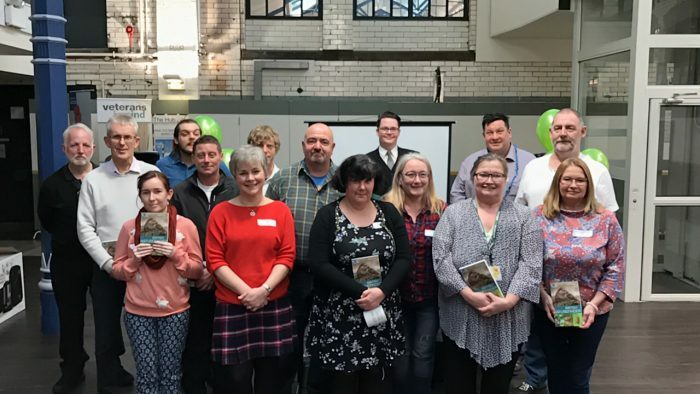 In addition to the celebration of trainees, the event which was held at The Gateway on Sankey Street was an opportunity for people to learn about the opportunities available in Warrington for people who are interested in the outdoors and the environment. Representatives from Reaseheath College, Myerscough College, The Conservation Volunteers, Lancashire Wildlife Trust, United Utilities and Continental Landscapes provided information to anyone interested in the sector at the event. “I joined Green Angels to upskill, to do something for the environment and to change things around my own area. It enabled me to get the skills that lead on to qualifications so I can take teams of people out and improve our immediate area. “Working together as a team and meeting new people has been particularly good. It’s refreshing to know there are lots of people interested in nature, which you tend to forget unless you’re involved in a team. “This is a very exciting time for Green Angels and I am thrilled to be able to take the time to recognise the positive outcomes of the scheme in Warrington. “We have some fantastic people involved with the courses and volunteering and it’s important that they know how much we value their time, commitment and success. Anyone who is interested Green Angels scheme should contact Carolyn Hassall at the Land Trust on carolynhassall@thelandtrust.org.uk or 01925 852 005. The Green Angels scheme holds sessions in Great Sankey, Westbrook, Bewsey throughout the year and has enabled people to get outdoors to learn and practice skills on courses such as conservation management, landscape maintenance, basic survival and environmental education.